DriveTime Reviews: Is it Legit? A Scam or the Best Car Shopping Dealer? Everything You Should Know About DriveTime Used Cars: Is it Legit? A Scam? Or is it One of the Best Car Dealerships? Purchasing a car can be an exciting process—but if you don’t find the right seller that will work with you and answer all of your questions, it can quickly become stressful and confusing. If you’re in the market to buy a car, it pays to make sure that you partner with the right dealership. For those that want to buy a used car, DriveTime offers quick approval, a large inventory, and best of all, no strict credit requirements. How much do you have to put down at DriveTime? What do DriveTime reviews say? Thinking about purchasing a used car? Keep reading for an in-depth discussion on whether DriveTime used cars are worth it. AdvisoryHQ DriveTime Review | What is DriveTime? DriveTime is a “Buy Here, Pay Here” dealership with 145 locations in 27 states. According to their website, DriveTime is currently the second-largest national dealership that focuses solely on selling used cars. DriveTime automotive sales have a wide reach, both among used car and new car dealerships. In total, there are over 14,500 DriveTime used cars available across the country, with over 1.1 vehicles sold since its founding in 2002. For car buyers that have had issues with credit histories in the past, DriveTime used cars offer a unique accessibility that other dealerships often cannot offer. See Also: ᐅ DealDash Review | Is it a Scam or One of The Best Penny Auctions? AdvisoryHQ DriveTime Review | How Does DriveTime Work? If you’re in the market to purchase a used car, DriveTime vehicles are available to view online with information on mileage, features, safety ratings, and Kelley Blue Book pricing. If you want to apply the value of your current car towards a new car, DriveTime automotive dealerships do accept trade-ins. In fact, customer trade-ins are one of the primary ways that the dealership obtains their used vehicles. The dealership can provide a price valuation on the spot from a third party, providing a convenient way to decrease the cost of DriveTime used cars. Unlike the majority of ‘buy-here pay-here’ dealerships, we don’t have the same down payments for everyone. We customize our down payments per vehicle and per customer. One unique feature that Drive Time offers is their 45-day reservation policy, where car buyers can reserve their car and get a little extra time to get their down payment together. DriveTime auto sales sounds like a simple and affordable process, but how do you know that this dealership is really the best place to get a used car? Before you commit to one of DriveTime’s used cars, you may want to take a look at DriveTime reviews to see whether past customers would highly recommend DriveTime—or whether they would tell you to steer clear. There are nearly 11,000 DriveTime reviews on TrustPilot, giving DriveTime automotive sales an overall rating of 4 out of 5 stars. With 78 percent of DriveTime reviewers giving the company a full 5-star rating, TrustPilot has given them a TrustScore of 8.8 out of 10. Many satisfied DriveTime reviewers state that purchasing a used car through the dealership was the “best car buying experience” they had ever had, expressing that the process was convenient and stress-free. 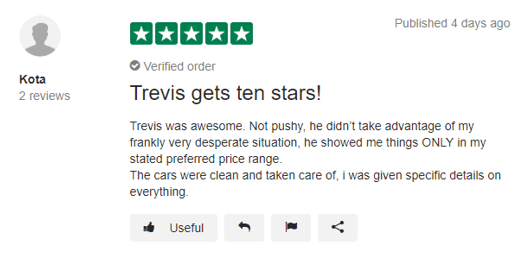 By and large, the most common point of praise from DriveTime reviewers on TrustPilot is the exceptional customer service that they received from DriveTime automotive employees. Reviewers state that their car salesman was honest, courteous, willing to answer all questions, and most importantly, not pushy or looking to take advantage of them. While many DriveTime reviewers report having a positive experience purchasing DriveTime used cars, there are some car buyers that were not satisfied with DriveTime. Many critical DriveTime reviews describe issues with rude or unprofessional employees, faulty warranties, and cars that are in and out of the mechanic shop. Down payment may be low. But my car had been giving me a problem since day one. The warranty they offer is a nightmare to deal with. The mechanics are not good. and they just seem unconcerned with fixing your car. Other complaints came from car buyers that tried to return their vehicle outside of the 30-day warranty or trade their car before the required 3-year period was up. 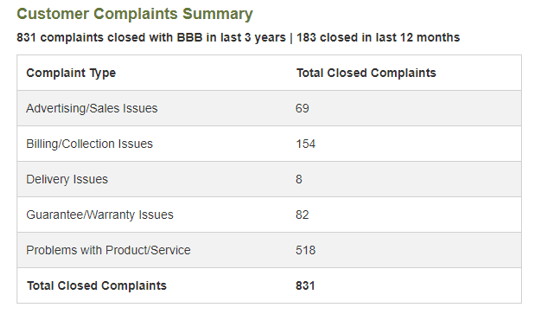 Although there are a large number of positive DriveTime reviews on the BBB, this AdvisoryHQ review found a significant number of complaints filed against the company. Although many of these complaints have since been resolved to the customer’s satisfaction (in some cases, refunding the entire amount of the car or forgiving the remaining balance), the frequency of these complaints may warrant additional consideration before purchasing DriveTime used cars. AdvisoryHQ DriveTime Review | Is DriveTime Legit? For used car buyers with less than perfect credit, DriveTime vehicles sound like the perfect solution to the strict credit requirements set by other dealerships. But is DriveTime legit? Can you trust DriveTime automotive dealerships? 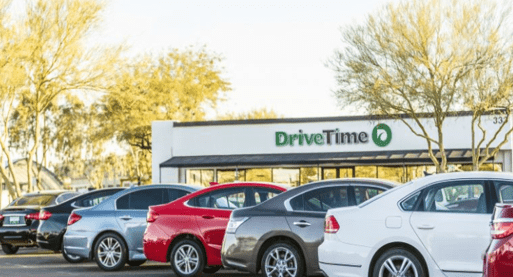 This AdvisoryHQ review found that yes, DriveTime is legit, with company headquarters based in Tempe, Arizona. DriveTime has been registered with the Better Business Bureau since 2012, and currently has an ‘A’ rating. Furthermore, based on DriveTime reviews, the dealership has built a strong foundation of consumer trust, selling over a million vehicles across the country. The vast majority of car buyers applaud DriveTime for their customer service, transparency, and accessibility, representing thousands of positive experiences with DriveTime used cars. AdvisoryHQ Conclusion: Are DriveTime Vehicles Worth it? For many car buyers, purchasing a car comes with numerous barriers, including price, down payment amount, and credit history. DriveTime automotive sales offer a unique accessibility that many dealerships cannot match, helping those who might not be able to purchase a car otherwise. Based on positive DriveTime reviews, there are thousands of satisfied customers that would strongly recommend considering DriveTime used cars. Many people have had overwhelmingly positive experiences with this dealership—not just for affordable pricing, but also for the overall professionalism and transparency offered by the staff. However, this AdvisoryHQ News review did find a few key criticisms to consider before signing up for DriveTime used cars. First, although the company does provide financing quotes online, final estimates only come from showing documentation in-person. Second, potential shoppers should consider that the company has had past issues with state laws, particularly where credit and information reporting practices are concerned. Third, complaints from car buyers on BBB suggest that there may be issues with the company’s inspection and quality control policies. Should you consider DriveTime vehicles for your next used car purchase? 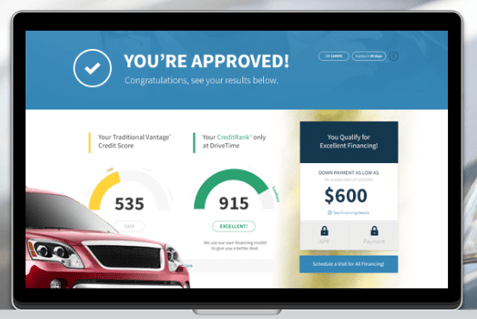 If you have less than perfect credit and are in the market for a used car, thousands of satisfied customers say that DriveTime is worth a try. However, based on the sheer number of complaints regarding overall safety and repair, we encourage you to use the same precaution that you would when buying any used car. No matter what car you end up driving off the lot, bring it to a mechanic you trust to ensure that the vehicle you purchase fits your long-term expectations.